We are cooperating with the ladies of Gya village to transform their pashmina, sheep and Yak wool into stylish knitted goods that visitors will wish to buy and wear. This 'win-win' situation will bring pleasure to the owners, and generate income for the ladies of Gya and for Druk White Lotus School. Ian Hazard is an Architect from Arup Associates who spent six months with us as a volunteer. Why not find out more about volunteer opportunities in Ladakh?. Sunday 2nd August: fine summer weather, the garden of a great English pub located in beautiful countryside, excellent food and lots of good music … a recipe for enjoyment and for raising funds for Druk White Lotus School. The Duke of Cumberland pub is located in a small village not far from the south coast of England. Around 300 people enjoyed the skills and talents of a range of singers, bands, poets and performers at DukeFest 09. Funds were raised for the school through an auction, a raffle and games - and our thanks go to all at ‘the Duke’, the performers, and everybody who participated. The Druk Foundation in the USA organised a gala event at the Rubin Museum of Art in New York. The evening focussed on the art of the Drukpa lineage and included a conversation between His Holiness Gyalwang Drukpa and Jeff Watt, Curator of the Rubin Museum, before an invited audience. This was followed by a screening of a documentary entitled ‘Druk White Lotus School - Ladakh’ produced by New York film company kontentreal and sponsored by Autodesk. Following a screening of the film, His Holiness took part in a Q&A with Jeff Watt, Rubin Museum Curator, together with Jonathan Rose (chief architect), Tad Fettig (film executive producer) and Philip Cornwell (trustee). In Europe a few days later, the annual retreat with the Gyalwang Drukpa was underway at Pel Drukpay Tcheutsok, the centre in Plouray, France. As ever, the Drukpa Trust and a dedicated crew of volunteers kept a display open throughout, fundraising for equipment for the Science Laboratoty. Always trying to have fun with the theme, this time donors could buy parts of the human skeleton 1â‚¬ buying a tooth and 100â‚¬ represented by a skull. By the end of the retreat, over two whole “skeletons” had been bought. International supporters helped to fill eight trunks with children’s books, clothes and other goodies for the school. JetAirways kindly transported the trunks from London to Leh at their own expense, and local JetAirways staff recently handed the trunks over to the School Principal, Maureen Songhurst. On March 18th 2007, Ushma Vaidya braved the cold spring morning to run in the Ironbridge Half Marathon to raise money for the Druk White Lotus School. Ushma said afterwards: “This was one of the most difficult races that I have ever run. This was due to the poor weather conditions I had to run in. It was hailing, raining and snowing. It was freezing cold with such cold gustily winds that I really can’t believe myself that I finished the race. But I just thought about all those children at Druk White Lotus School and thought I have to do it for them. I would like to go to Ladakh and meet all the children at the school. Students from Alton College, England, recently raised and donated Â£1,300 towards a project they will complete at Druk White Lotus School. The World Challenge students will travel to Ladakh and be at the school in mid-July. They will help with implementation of the school’s new landscaping plan by constructing a mudbrick greenhouse and some local terracing. 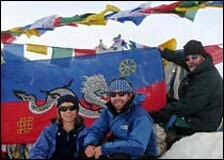 The picture shows group leader, Ivan Bicknell, presenting a cheque to Drukpa Trust’s Annie Smith. On the 20th May 2007, the school’s launch on the LA scene took place at the Architecture + Design Museum Los Angeles, within its theme of ‘Enlightened Development’. Bruce McKinlay of Arup and Elizabeth Shanklin of Ogilvy made presentations explaining their firms’ activities at the school in Ladakh; His Holiness Gyalwang Drukpa presided, and Donovan kindly serenaded the audience. The event raised valuable funds towards the school’s 3rd Residence, which must open by November 2007 in order to receive incoming children from remote areas. This event, organised by Druk Foundation, was made possible by the generosity of the A+D Museum, and corporate sponsors Arup and Ogilvy. Stok Kangri'ssummit (6,121m) last summer! Their determination to complete the challenge, in the midst of difficult weather conditions, helped to raise nearly Â£6000 for the school.